Department of Revenue and Land Reforms, Govt. Of Bihar has released a notification for 6875 posts of Amin, Special Survey Amin, Special Survey Assistant Settlement Officer, Special Survey Kaanoonago, Special Survey Clerk. The Bihar LRC Amin Notification 2019 has released on the official website download link provided below. Interested & eligible candidates can check Bihar Special Survey Amin Vacancy 2019 & fill the application form through online mode on or before the last date. The Bihar LRC online application form available from 11th March to 01st April 2019. Aspirants before applying the recruitment online registration form can download the advertisement pdf, check terms and conditions carefully. Bihar LRC Amin selection process is the basis of written examination and interview. Aspirants can check application dates, eligibility, post wise vacancies, eligibility, Bihar Special Survey Kaanoonago Selection 2019 process, application procedure, salary structure, and more information in the below article. All the interested contestants are required to confirm whether they fulfill all the necessary eligibility criteria or not and then only proceed to apply for the online application through the official page. Candidates username/registration number and password will generate. After submission of application, aspirants take a copy of the application form & fee receipt for further uses. The written examination hall ticket of Bihar LRC Amin will publish on the official website. Candidates who have completed the online application form procedure can now get Bihar Special Survey Kanunago Admit Card 2019. Applicants will get the written examination hall ticket 15 days before the test. The Bihar Amin hall ticket will contain details like registration number, hall ticket number, test venue, test slot, test time, test date. The Clerk Admit Card is an important document for entering the examination center as without it the candidate will not be allowed to enter the exam hall. The result of Amin exam will declare on the Bihar LRC official web page. The Bihar Amin Clerk Result 2019 will publish within 2 months of examination. Aspirants who have attended the exam can check result through Bihar LRC official web portal. Candidates will get the intimation message regarding the result release date on registered mobile number. Bihar Amin exam conducted board will issue the result, cutoff marks, scorecard, merit list on the official web page. 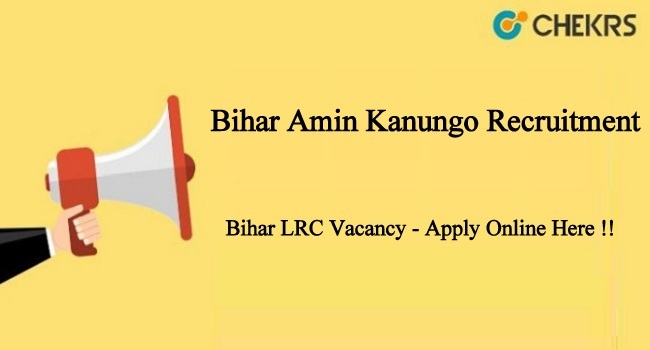 Remarks: For more details regarding the Bihar Amin Kanungo Recruitment 2019 refer to official notification pdf. Any query & doubts regarding this notification you can place your valuable comments in the commenting section below.